Without question, the Lumpia has to be the most ubiquitous food on many occasions such as birthdays, Christenings, fiestas, and weddings. This crispy recipe has successfully captured the taste of Filipino kids and grown-ups alike. It is often served with the pancit as a side dish although many also loves eating them with rice along with other dishes. This crispy spring roll food is well-loved by kids and grown-ups alike and is served in many different ways – such as the recipe we have below. The Lumpiang Singkamas, as the name implies, is your traditional lumpia but with a twist. Like other lumpia, this has different vegetables and, depending on your preference, some meat. What makes this unique, however, is that singkamas (turnip) is used as one of the ingredients. The turnip gives the food a distinct taste and makes every bite crunchy and yummy. You can dip this in your choice of sweet sauce or vinegar with minced garlic, onion, and pepper. 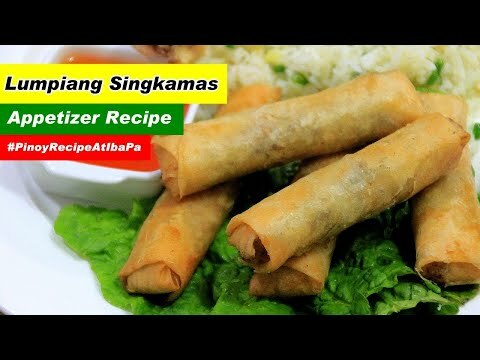 Lumpiang Singkamas Recipe is as healthy as it is delicious so don’t forget to give this recipe a try if you want to have some fun food for the whole family. Add-in the meat, pepper and salt then cook until meat changes color – about 3 to 5 minutes. Making sure to mash it from time to time to separate the meat. Add-in the Carrot, Red bell pepper and Singkamas then mix well and cook for 3 minutes. When cooked, remove Lumpia mixture from the frying pan, set aside and let it cool. Fry the Lumpiang Singkamas in batches until the Lumpia wrapper turns brown. I haven’t heard of or ever tried it BUT definitely sounds delicious! I have never tried these but my husband loves them. Thanks for the recipe. These are fabulous, just the right snack or appetizer. I have yet to try these. I honestly have never tried them before, but it does sound very good. This looks really good. I will have to try it. Thanks! This Lumpia is new to me, I will try it because the ingredients are very interesting. I hope it turn out delicious.